German police use mirrors to check for migrants hiding in the narrow space under a freight train container. RAUBLING (GERMANY) - The worn-out shoe lying in the thin space between a train carriage's flat-bed and the goods container is a tell-tale sign that a stowaway had hitched a ride, said German police tasked with detecting migrants. "Maybe the migrant jumped off the train to evade checks in Austria and had no time to put his shoe on," said Rainer Scharf, a police spokesman at the small southern German station of Raubling, where a team of officers had arrived to inspect freight train carriages. A little further down under another container, flattened water bottles and biscuit packaging suggested that at least one other migrant was on the train. Such finds are becoming alarmingly common as freight trains gain popularity with migrants seeking to reach northern Europe. Many of these mostly sub-Saharan African or north African migrants have arrived in Europe by sea, boarding rickety vessels to cross the Mediterranean from Libya to reach Italy. Since 2014, more than 600,000 people have landed in Italy after the dangerous sea journey, and some 14,000 people have lost their lives trying to cross. And some are taking a second gamble with their lives by jumping on freight trains to get to destinations such as Germany. Between July and mid-September, more than 200 people were found on such trains. In comparison, there were hardly any such stowaways in 2016, and only around 20 cases in the first half of this year. Police say the new route arose after Schengen countries reimposed border controls in the wake of the 2015 migrant crisis. Asked why they were risking their lives again, the stowaways said that they were desperate to leave Italy as they didn't feel welcome, or because they wanted to make money or learn a trade. Others said they want to rejoin their families who are already in Germany, Scharf said. "But it's still extremely dangerous," he stressed. To travel undetected, the migrants lie in the small gap between the goods container and the flat-bed of the train carriage, remaining immobile for hours. "A wrongly calculated move could result in them falling on the rails while the train is running at full speed. And that's not even taking into account the fact that the trains travel through the mountains where it can be very cold, even in the summer," said a policewoman. The corpse of a young migrant was found on the rails close to the Austrian border in early June, believed to have fallen off a freight train. The tragedy led police to boost checks at Raubling, just a few kilometres away from the Austrian border. 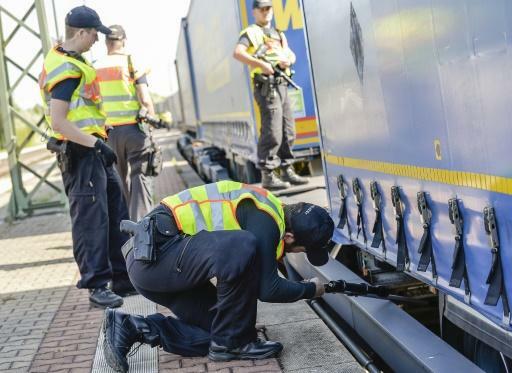 Around 30 officers turn up several times a month to inspect the trains, using ladders, mirrors and torchlights to look at potential hiding holes. When the weather allows for it, a helicopter equipped with a thermal camera flies over each train to detect migrants through the heat emitted by their bodies. "A few days ago, I was on the platform when the police took two migrants from their hiding places in the train," said Kauer Zimmerman, 72, a Raubling resident. "I was shocked by the condition they were in -- they were covered in big jackets but still shivering." Like her, the 11,000 inhabitants of the Bavarian town are getting used to regular delays on passenger trains as the schedule is affected by freight train checks. "The Italians let the migrants go, the Austrians too, and so they arrive here," said Birgitt Nopper, a pensioner in Raubling waiting to catch a train. Scharf defended Austrian police, saying they work in close collaboration. "We work closely with Austrian police. If they have already checked a train, we're not going to check it again." The worn-out shoe lying in the thin space between a train carriage's flat-bed and the goods container is a tell-tale sign that a stowaway had hitched a ride, said German police tasked with detecting migrants.